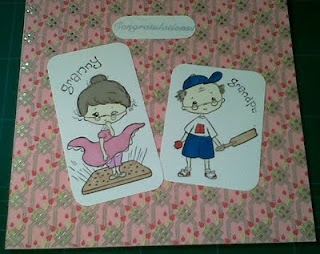 I have made this card for a twitter buddy to celebrate to birth of her first grandchild. 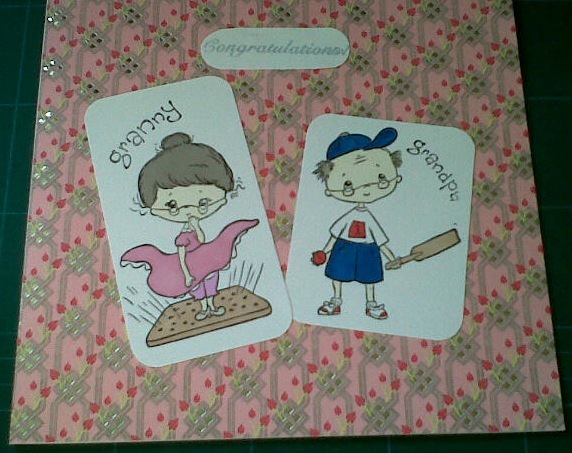 So many congratulations to Shirley n Charlie!!!! I stamped the Crafters Companion SWALK granny and grandpa images, coloured them with promarkers, I stamped the sentiment and embossed with cosmic shimmer powder, then mounted them onto Lawrence Llewellyn-Bowen papers all on top of an 8" square card. I couldn't do anything less than a fairytale castle, considering the fairytale wedding now could I. 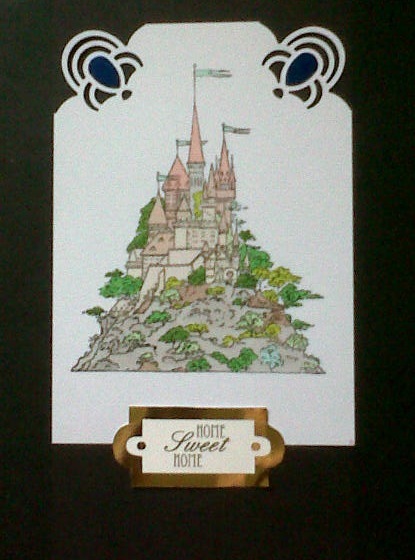 The image is from Papermania fantasy range of clear stamps. I used a Martha Stewart corner punch to make it more regal. Added the sentiment and mounted onto black A5 card. Ever since Easel cards have been on the go I wanted a go at a twisted one, well here it is. I used an 8" card blank as the base, hunkydory kit for the decoupage and stopper, I used a contrasting handmade paper and a self adhesive butterfly for added dimension. Added a peel off label and letters into label. Was a bit pleased with this one, hope you like it. I used a frame that was included on some disney stickers to enhance the Nellie Snellen Gorjuss girl (I love these stamps). 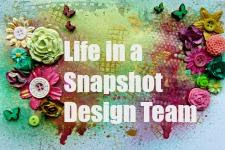 I then mounted this onto Hunkydory embossed cream card. 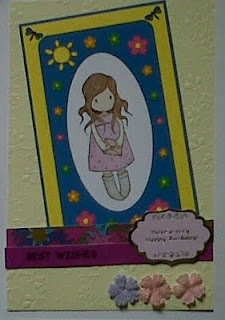 Added the borders, and the flowers embellishments, topped off with a birthday greeting. 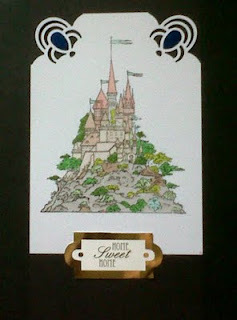 stunning card jacqui.i love the magical castle and gorgeous colours and design. Really a fab castle. I love it and i really like your card. 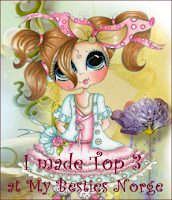 Great to see your easel card at Polka Doodles! Thanks for joining us and good luck! Lovely card for Willow Sketchie Challenge! Thanks!! Great card. Thank you for joining in the ABC challenge this time. Gorgeous cards Jacqui. Love the CC SWALK images, so cute. 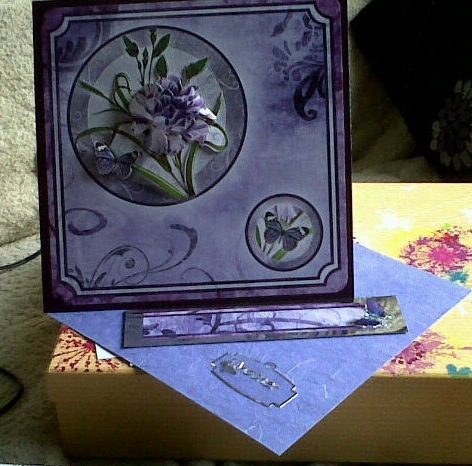 Really lovely cards and the easel one is so pretty. Thanks for joining in with Polka Doodles easel card challenge and good luck. Very pretty and great colours too! Thanks for entering the Polkadoodle Challenge - hope you can join us again next week! I love those other cards you have made too. Good luck in the challenges.